I love it when new restaurants open on the west side. It seems to be happening a lot lately. There’s some kind of growing boom on this side town. There’s a lot of empty land in really good areas so new businesses seem to be flocking to Oshtemo. Five years ago, a new brewery opened in Portage and they did a really good job on social media of creating a buzz. We were there on opening day and have been back several times since. That brewery, Latitude 42. Last summer, I was scanning through planning commission agendas for Oshtemo Township. We live in the township and I like to know what’s going on. I hate people that claim ignorance to things because they don’t pay attention to local government. I like to know what’s going on and I don’t have time to go sit through the meetings so agendas and minutes posted on the township’s website fill me in on what’s happening. It’s always exciting when I see site plans for new businesses opening but one really got my attention. 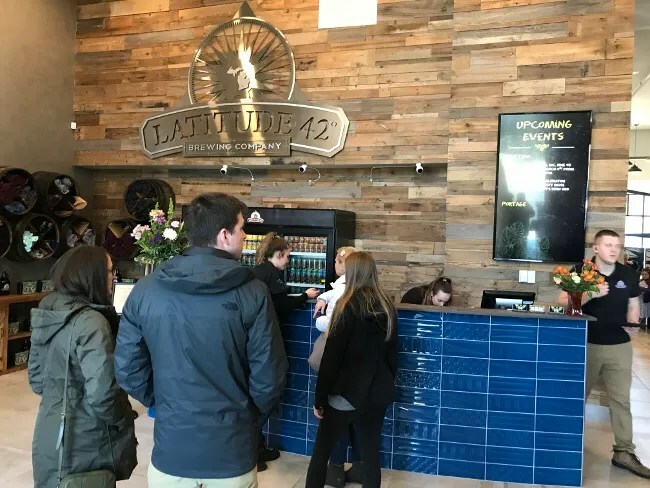 Latitude 42 was going to open a second location. 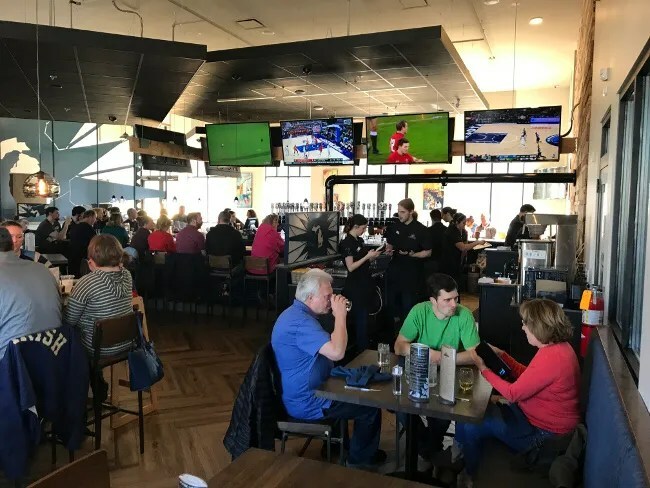 The Oshtemo location of Latitude 42 opened at the end of February on West Main (M-43) just west of the US-131 interchange. It’s a new construction building that’s designed very similarly to their location in Portage. We didn’t do opening day at this one just because I was at work and by the time I got home, we didn’t want to fight the dinner crowd. We actually waited a couple of weeks and went for an early dinner on Sunday with hopes to get in before the usual rush started showing up. The design is similar to the Portage location but a little different too. 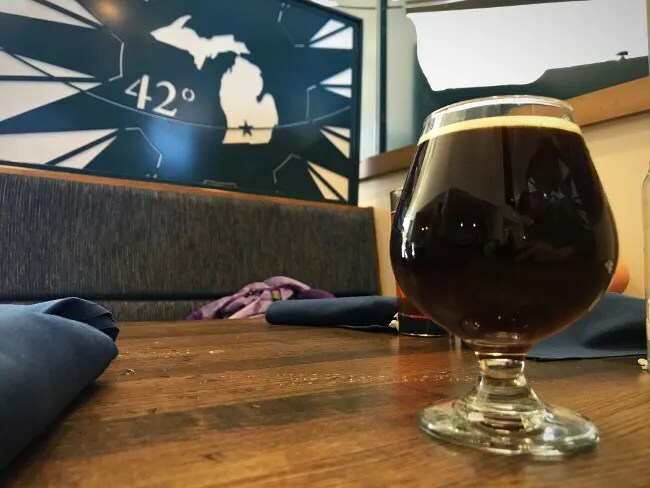 If you’ve ever been to the Portage Latitude 42, you know there can be long wait times. They designed the entrance a little different to allow more room for benches so you’re not crowded around the bathrooms in a narrow hallway. The host stand is back from the door quite a ways leaving room for a line to que up and room for seating around the edges so people have a place to wait during the busy times. They have merchandise and canned beer for sale in this area as well. We just beat the rush and got one of the last available tables. The restaurant is set up with the bar kind of in the middle of the space. It is separated from the dining room that surrounds it. The large horsehoe bar has TV’s mounted above the taps in the middle. There are tables in the space surrounding it if you prefer the sports bar feeling or just don’t want a booth. The dining room area is an L-shape around the bar. There are rows on booths on either side of the aisle which give you a semi-private dining experience. Most of the bigger booths have large dividers between them with a design showing the state of Michigan with Kalamazoo starred. Kalamazoo’s location is (approximately) 42 degrees North latitude and 85 degrees West longitude. 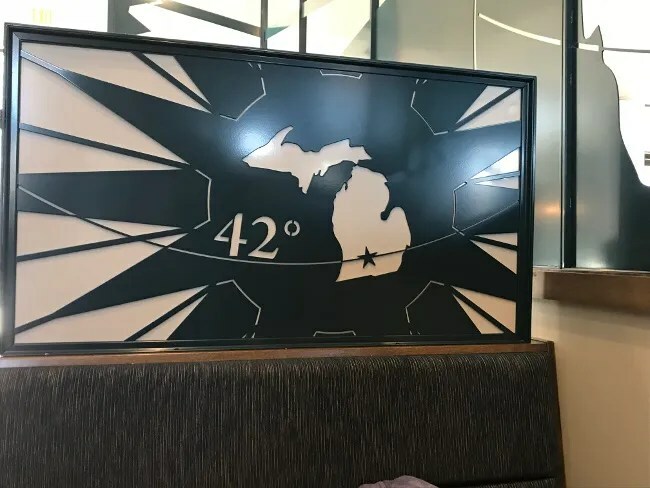 That 42 degrees is shown on the divider and it’s where the brewery gets it’s name from. One of the big reasons we love Latitude 42 so much is the play area for the kids. I mean, the food is fantastic as is the beer, but if we can’t enjoy ourselves, what’s the point? The kids love the two play areas at the Portage location, so we were excited when we saw pictures of them building a similar one in Oshtemo. I didn’t get pictures of the whole thing because there were so many kids there playing when we were there. 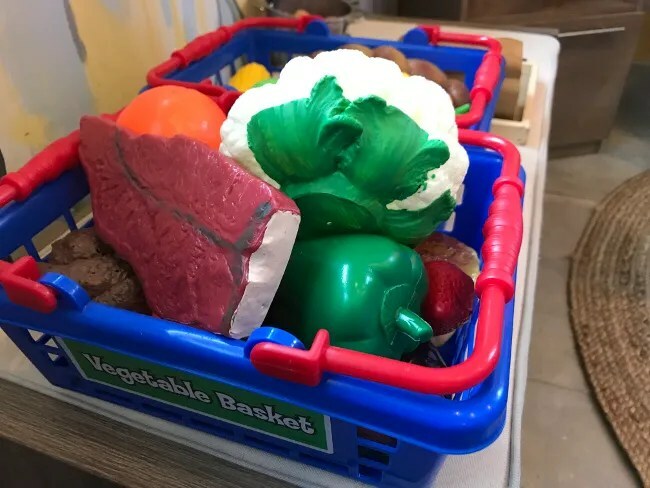 It’s a pretty simple set up with a table and play kitchen with a lot of play food. The kids, who didn’t know each other, all worked out a pretty good game where they were playing restaurant on their own. One was a server, one was the cook, and three or four were customers sitting at the table. There’s also a chalkboard to play with. 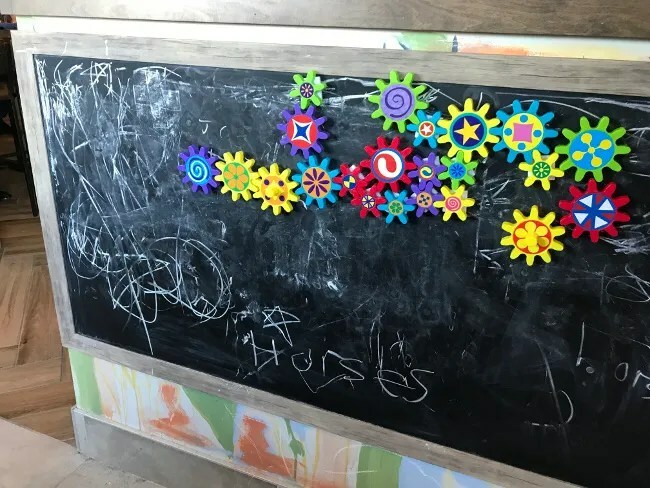 I’m surprised kids still know what a chalkboard is. B and I scribbled on it for a while when he got tired of playing with the older kids. 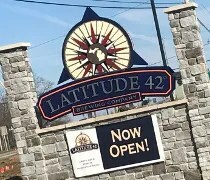 Latitude 42 has really done a great job over the last five years of having a large, diverse tap list. They have their staples which are always a good bet, but they also have some unique ones that pop up every so often. I ordered the 2015 Auld Tallywacker which is aged in Port Barrels. Oh man, is this a delicious Barleywine. 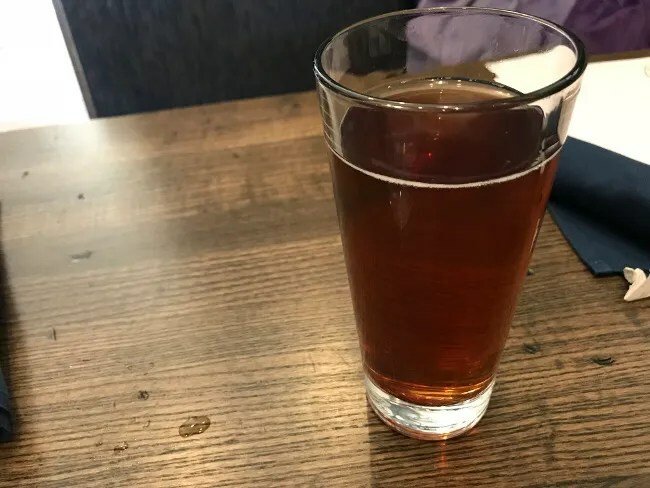 The pour was much bigger than I expected and it was a good sip with dinner kind of beer. It’s a strong boozy, Barleywine but the slight sweetness from the barrel aging tones it down just a bit. J ordered the Latitude 42 Cider which is a pretty typical order for her here when they have it. It’s a nice crisp cider that drinks easy with meals. The kids both got “Bubble Juice” which is a 50/50 soda water and juice drink. We’ve always really loved on kid friendly Latitude 42 is. It’s more than just a kids menu although they do have one that our kids love. We got them each a pizza. 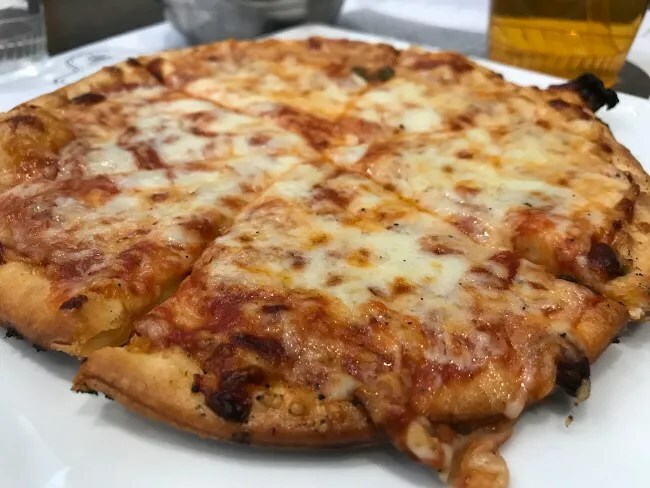 The pizzas are 8″ pies on the kids menu made with spent grain We got each of them one because every time we get one to share, they both want more. L got a pepperoni while B got a plain cheese. 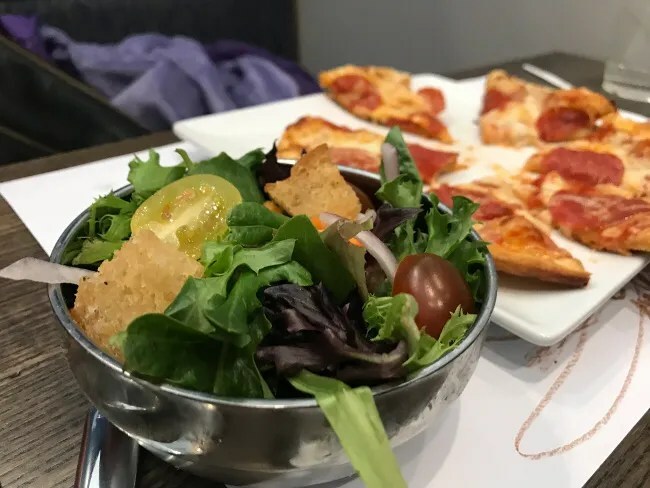 B stuck to fries for his side, but L went with a salad. She’s surprised us a lot lately and really enjoys salad. 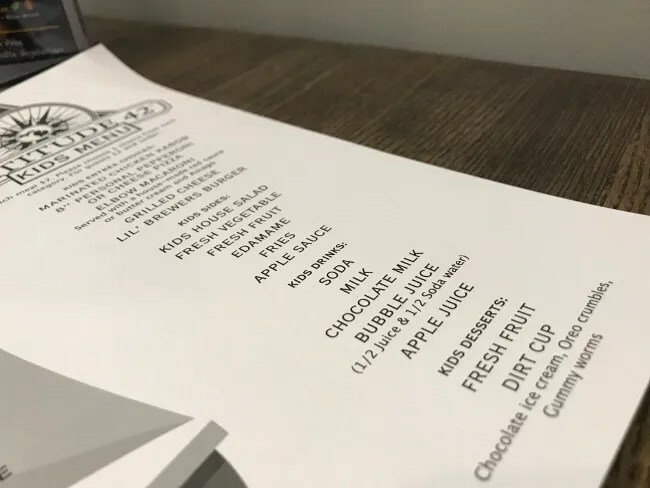 We have a hunch that’s all she’s eating at school, but when she orders one, we’re not going to argue with her….she typically eats it all. The side salad for the kids is mixed greens with onions and tomatoes. We got her a balsamic vinaigrette. She ate about half it and had very few complaints. I almost always get a burger at Latitude 42. There are two I really like so I go back and forth. On this visit, I did the Umami Burger. The burgers are Angus beef and come served on a brioche bun. 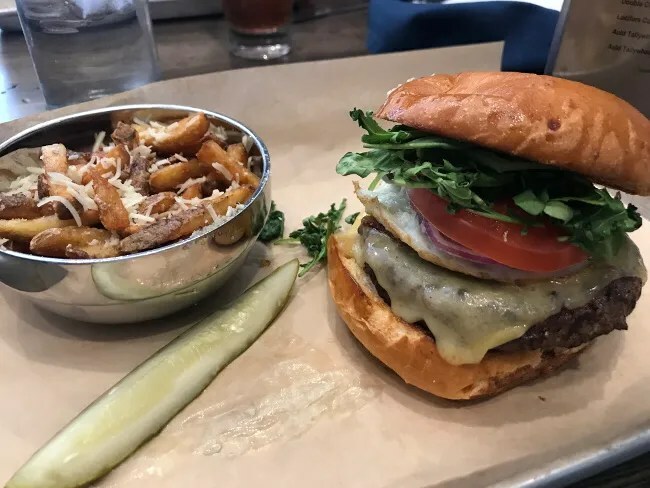 This burger is topped with Havarti cheese, a fried egg, tomato, red-onion, arugula, beer-bacon, and a black garlic truffle aioli (I left this part off). These burgers are always cooked so perfectly with just a hint of pink in the middle. The bacon always seems to be a little over done because it’s a battered bacon but it’s still tasty. The fried egg comes from a local farm and it’s cooked so it’s just slightly runny giving the sandwich even more flavor. I upgraded to the Truffle Fries which come covered in truffle oil and shaved Parmesan. They’re worth the extra two bucks. 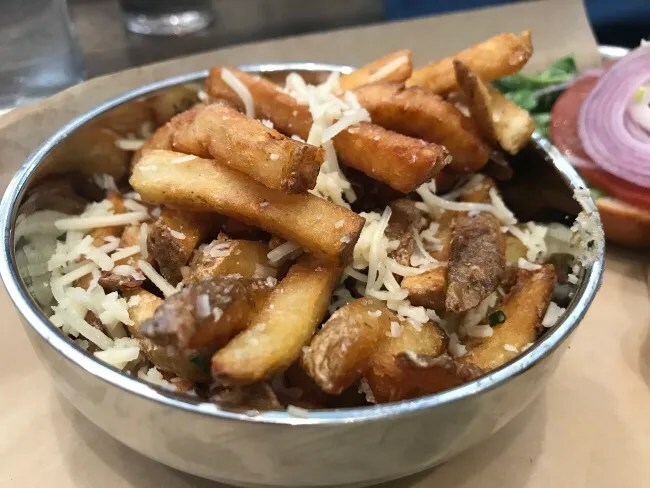 The skin-on fries are nice and crispy on the outside and the Parmesan gives them a salty but delicious taste. J went a completely new direction and ordered the Chipotle Chicken tacos. The tacos are a flour tortilla warapped around a blue corn hard shell with a layer of queso in between. 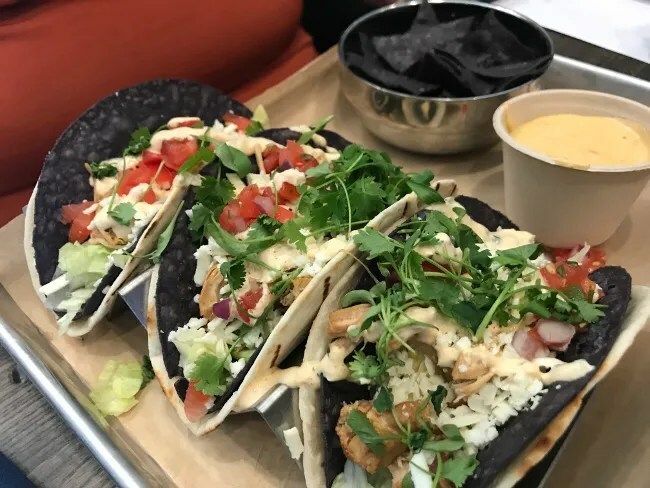 These particular tacos are Chipotle braised chicken with pico, Cilantro, Cotija cheese, lettuce and a Chipotle crema served on the side. J was worried about them being too spicy but she said the pepper hotness was perfect. She’s one of those people that doesn’t really like Cilantro so she pulled a lot of it off. I, on the other hand, love Cilantro and it was about perfect for me. We are not people that stray from our usual very often, but J went out on a limb here and was really happy with her decision. She’s explored this menu a little more than I have and making decisions is getting difficult. Her meal came with blue corn tortilla chips on the side. Back to the kids. They get dessert with their meal so after we got done eating, we let them go back and play while their dessert was put together. The kitchen got slammed with about 10 kid’s dessert orders at the same time so it took quite a while. The dessert is a Dirt Cup. 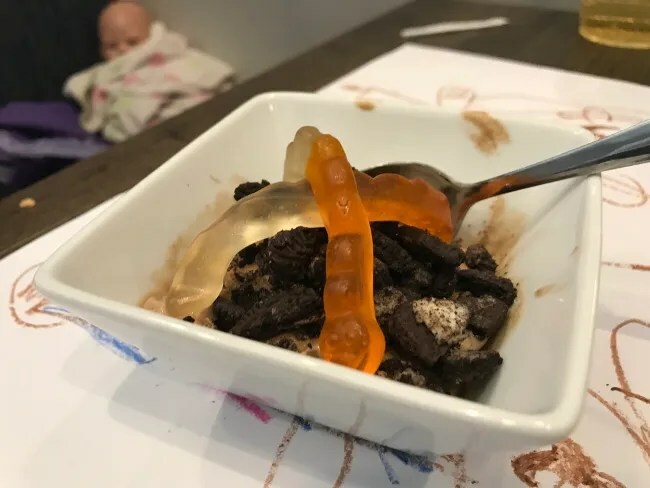 It’s chocolate ice cream with Oreo cookie crumbs and gummy worms. As you can probably guess, neither kid likes to share. Our bill for dinner was a little over $50 before tip. You have no idea how excited we are that Latitude 42 chose to open their second location just a mile and a half from our house. 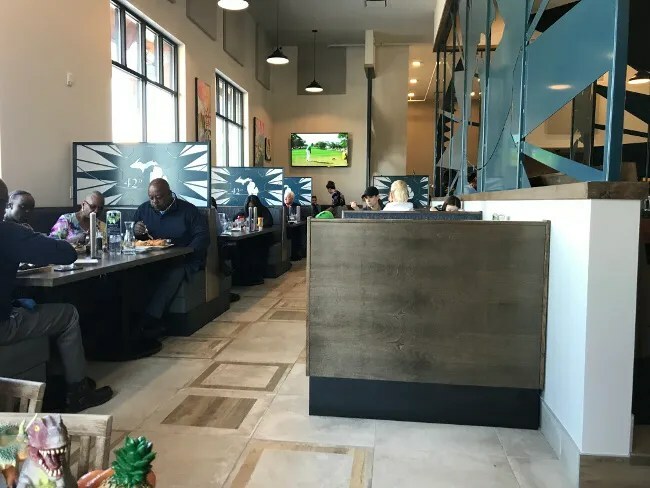 We have always loved the Portage location but it’s like a 20 minute drive and it’s usually so packed at dinner time. 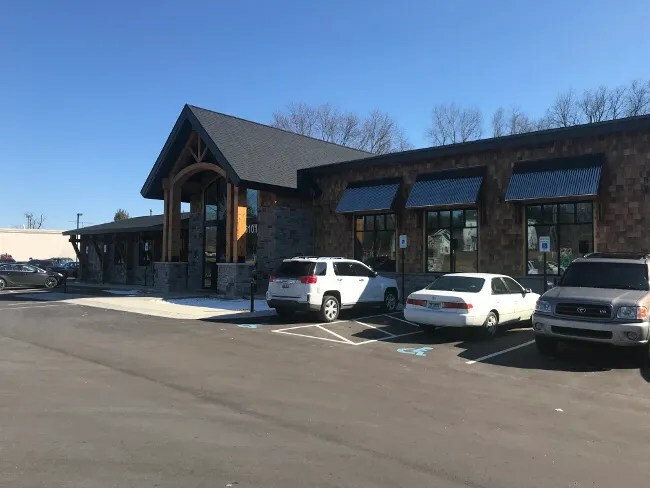 We are going to be eating dinner at this location in Oshtemo a lot….and if they ever build a beer garden like the one in Portage….forget about it….our bank account is going to take a huge hit.